Every quadrilateral has four sides and four interior angles. The measures of the interior angles add up to 360°. The following are special quadrilaterals. • A quadrilateral with four right angles is called a rectangle. Opposite sides of a rectangle are parallel and congruent, and the two diagonals are also congruent. • A rectangle with four congruent sides is called a square. • A quadrilateral in which both pairs of opposite sides are parallel is called a parallelogram. In a parallelogram, opposite sides are congruent and opposite angles are congruent. Rectangles and squares are also parallelograms. • A quadrilateral in which two opposite sides are parallel is called a trapezoid. The following video shows how to classifying quadrilaterals based on the given information. Any side can be used as a base. The height corresponding to the base is the perpendicular line segment from any point of a base to the opposite side (or an extension of that side). 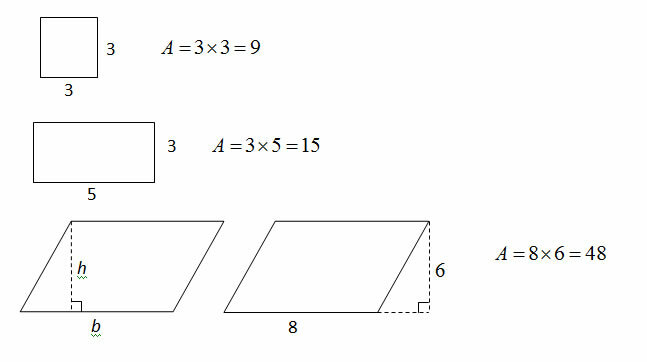 Below are examples of finding the areas of a square, a rectangle and a parallelogram. This video gives formulas and examples for how to find the area of squares, rectangles, triangles, parallelograms, and trapezoids. The video also explains the difference between base and height.